Just a bit of background, I'm in my early 30's, married, father to a little girl (another on the way) and work full time as a graphic designer. I have a 2.5 car garage to work in, but throughout the winter I have had to share it with 2 cars, making my building time sporadic, at best. I've been playing guitar for 15 years, and have been playing weekend gigs in various bands for at least 10 years. My most recent band played our last show on St. Patrick's day, and now is a good time for me be "retired" from playing, what with a new baby on the way. I have done a bit of wood working over the years. My father dabbled in wood work occasionally, but never took anything beyond the level of "rough carpentry". 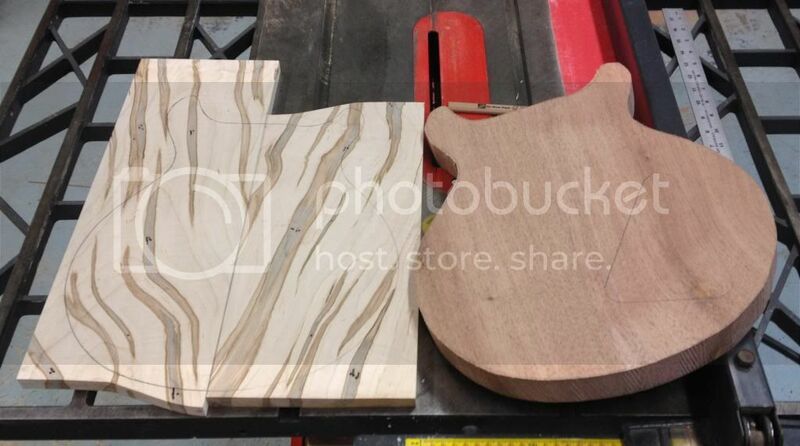 I've built a few pieces of fine furniture for my house and a couple of other decorative projects, but guitar building is taking things to a whole new level. I'm off work today, and while I would love to be building, I cannot. I'm sitting at home with a sick little girl who is happy to watch Dora while I type away. I'm mostly starting this build thread, because I have a ton of pictures sitting around, have made a lot of mistakes that I want to document before I forget, and the actual building has slowed to a crawl due to work and family obligations. As the weather has warmed up, I have to spend more of my weekend build time dealing with typical homeowner stuff. With a new baby due in 7 weeks, I know that I won't get these builds finished this summer. But I'm going to squeeze in as much as I can, document as I have time, and finish them eventually! I'm sorry for the photo quality that you will see throughout this thread. I am capable of taking a semi decent photo with a good camera, but all these pics were just snapped with my iPhone for the sake of convenience because it's always with me in the shop. 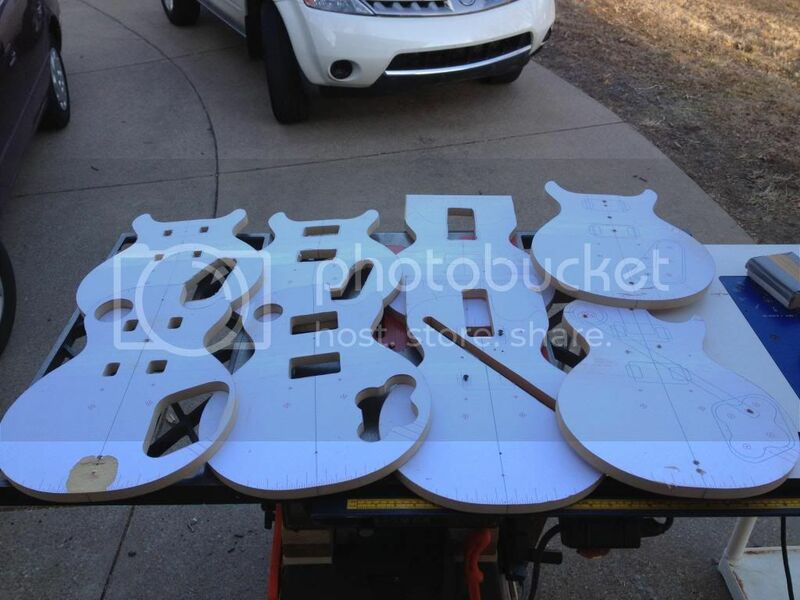 If and when I get these FINISHED, one of my pro photographer friends is already lined up to shoot the guitars in his studio (perhaps with a lovely lady or two). Im basing my build on the Bartlett 59 plans, but with a few modifications as Im not overly concerned with vintage accuracy. 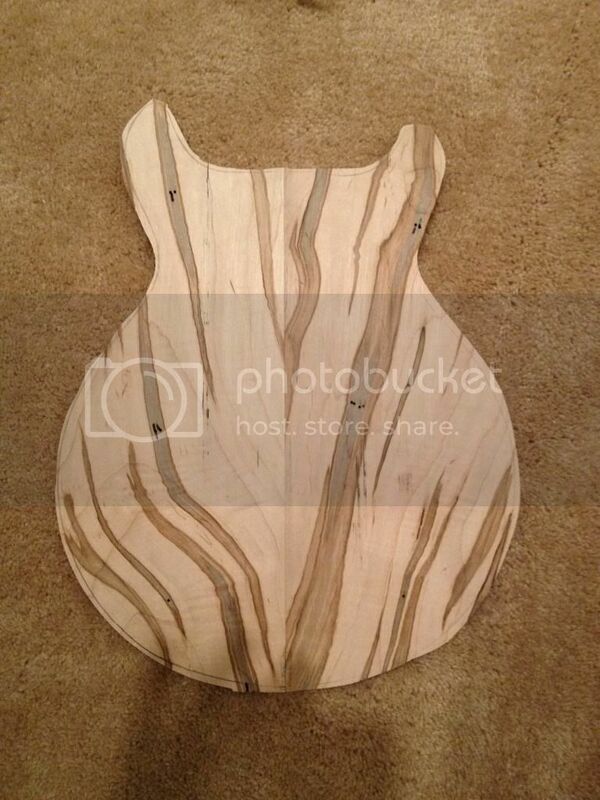 Its going to be somewhat of a cross between a Custom and a Burst. I purchased a set of plans from Tom, and then spent quite a bit of time trying to figure out how best to reproduce them. As a designer, I wanted digital files so I could tweak them as I saw fit. I had a few false starts trying to get these full-scale plans into a digital format. I tried shooting the plans with a good camera, but there was too much distortion to be useable. I tried scanning the nearly 7 foot long print out on my tiny 8.5" x 11" flatbed scanner and then piecing together 25+ separate sections, ending in epic failure and time wasting. In the end, as it turned out, simple was best. Yes, that's a glass patio table, with a par can under it. 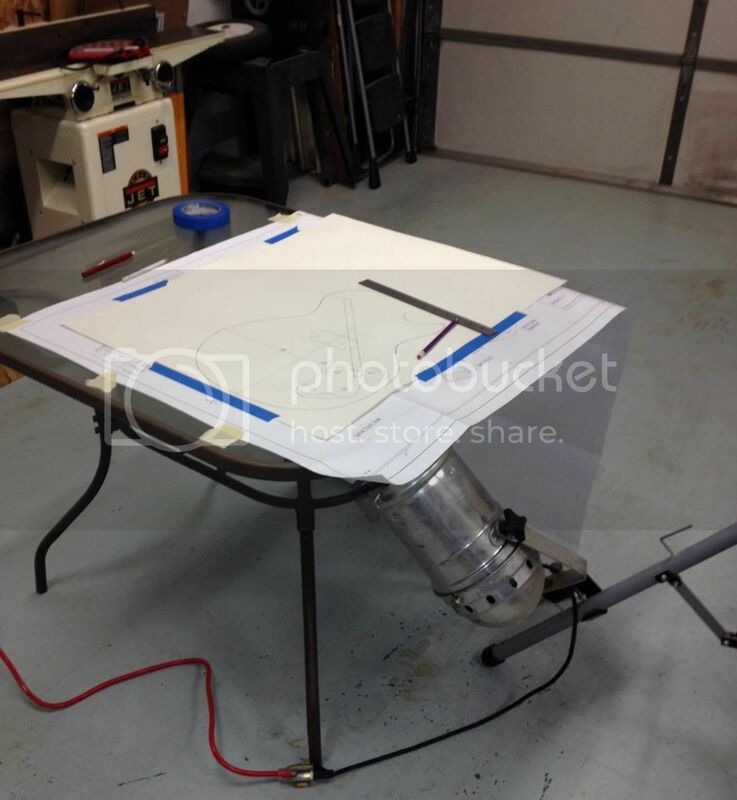 I taped down the large blueprints, laid a piece of poster board over the top and traced the parts I needed with a pencil. This was the dead of winter, so I had to scrape the snow off of my table, drag it in the garage and wait a few days until it was thoroughly dry. Then I scanned in the poster board on an 11x17 flat bed at the office, leaving me only TWO pieces to put together digitally. 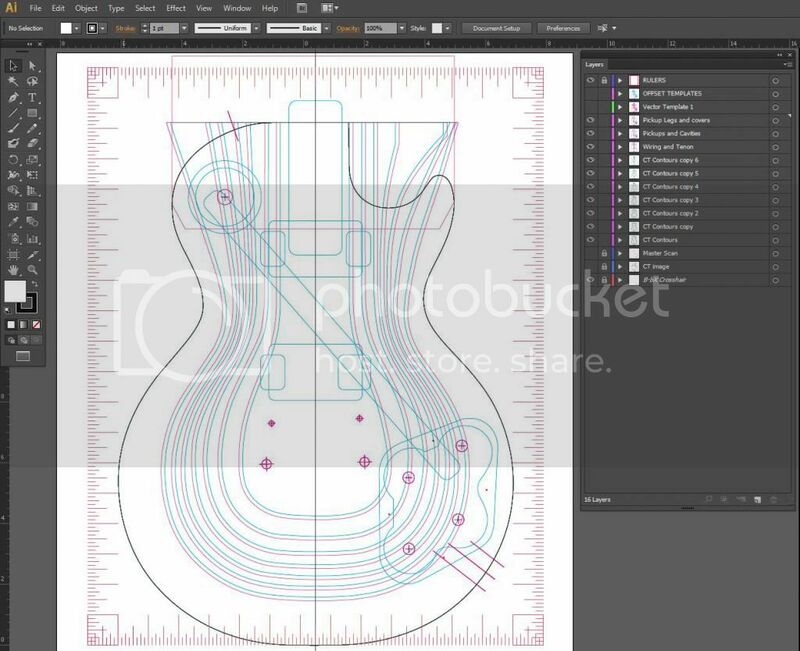 I then spent a lot of time re-tracing in Adobe Illustrator and setting up the template dimensions to work with an offset template bushing on my router (more on this later). I also added in the carve steps that exNihilo came up with. Thanks, Scott! I later changed the actual step templates to more closely resemble Scott's revision to the toggle switch area. This might look confusing, but to somebody who works in this software every day, it's been the easiest part of the build! Out of respect for all of Tom's hard work, I will NOT, under any circumstances share these files that I have created. I'm just explaining the basic steps that I went through to adjust his blue prints to suit my needs. Thanks again, Tom, and I hope I'm not stepping on any toes with this. 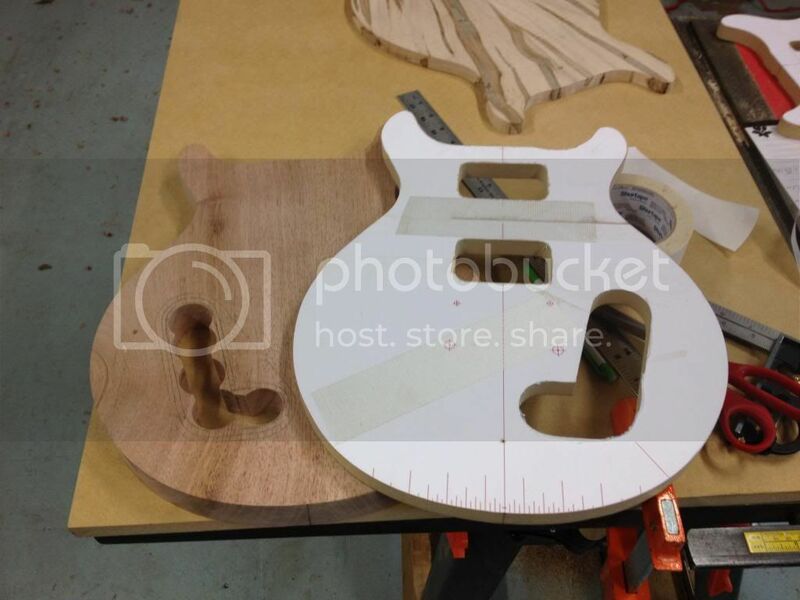 I did, however, make a second set of plans based on my Hamer studio, when this build split into two guitars (more on this later). Those plans were all done by me. 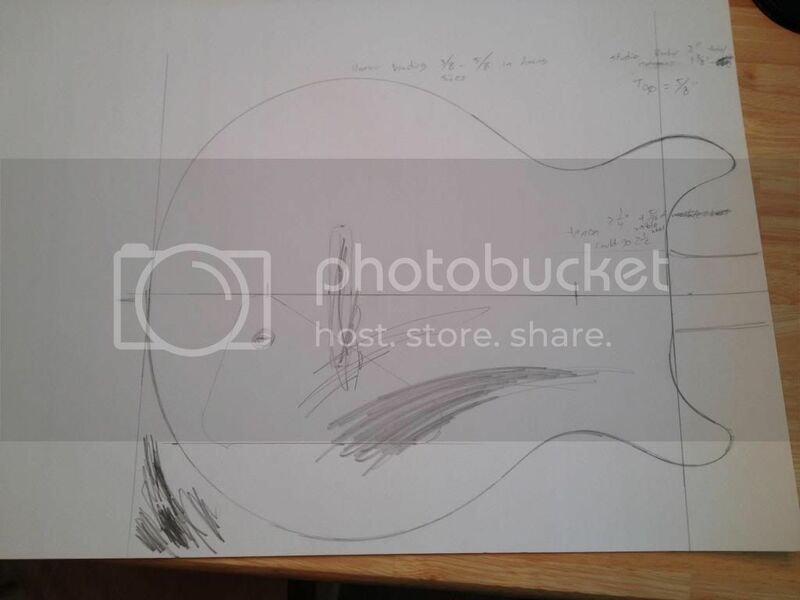 I stripped and measured the original guitar and came up with my own topographical map of the carve. If anybody wants this set of plans at a later time, I would be willing to share those. 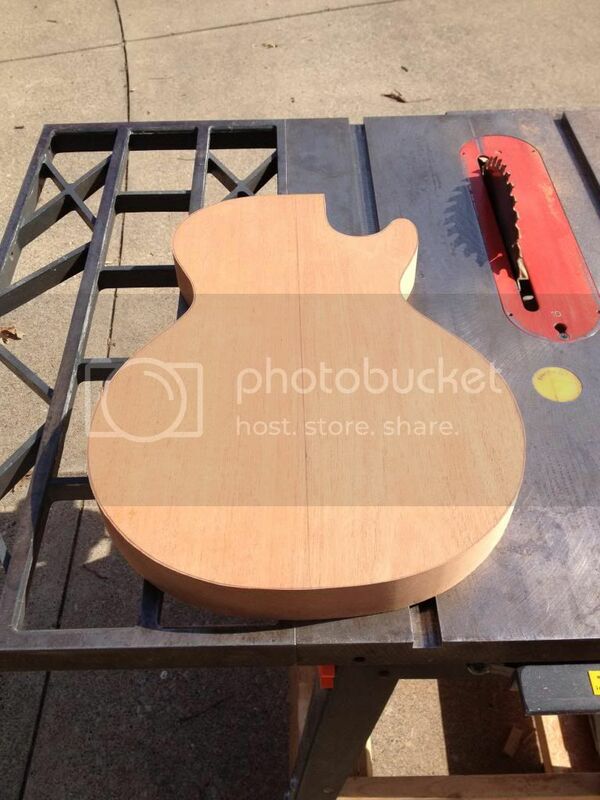 But let's see how this guitar turns out first! Cool work Dave - love the Hamer! 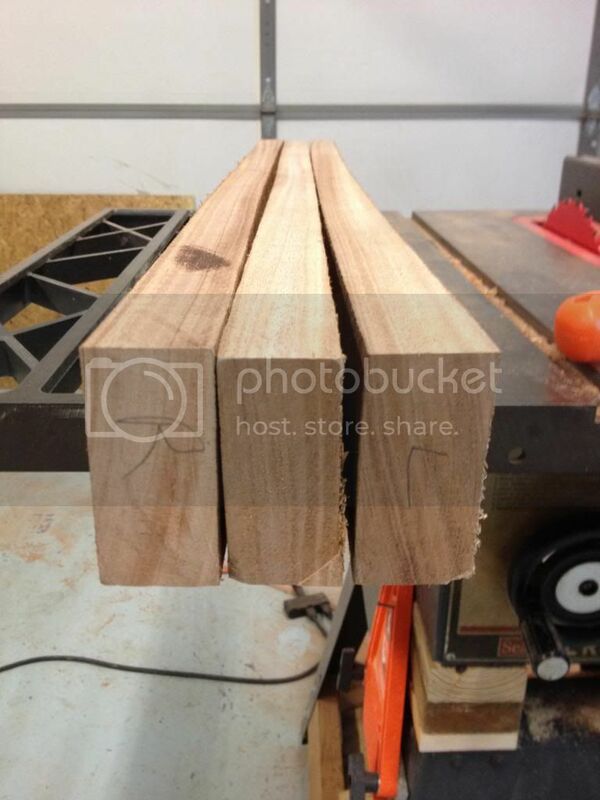 Here is the rough lumber I started with. 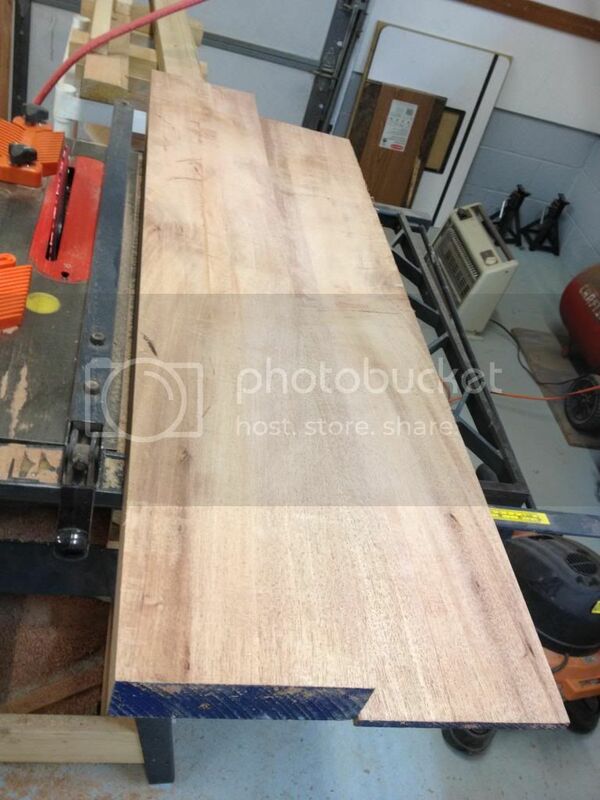 A piece of 12/4 African Mahogany wide enough to do a two piece body, and a piece of 5/4 to make a 3 piece neck blank. Aand a beautiful 2" slab of flame maple that I got for next to nothing on ebay, too bad it wasn't quite dry enough (more on this later). 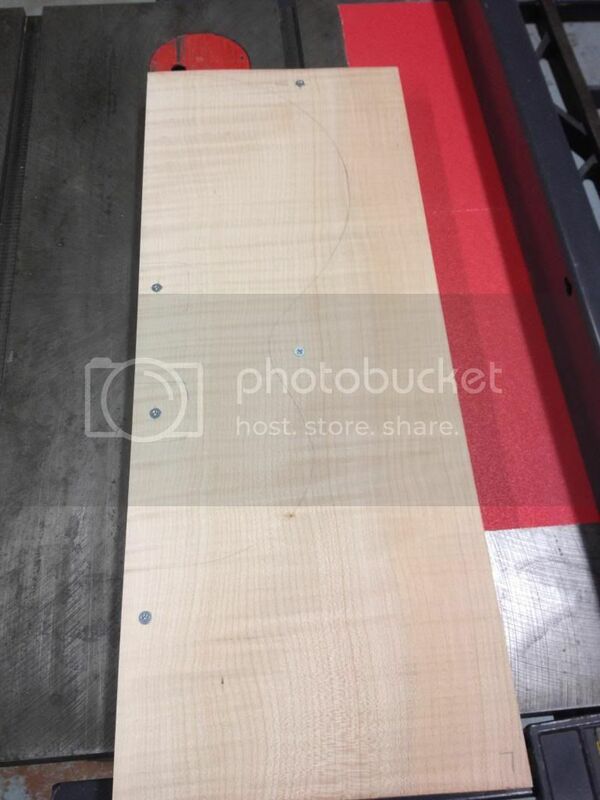 I want to use a 3 piece laminated neck, because thats how Hamer used to do it and the necks on my two USA Hamers are rock solid and stay where I put them. The one piece neck on my Les Paul classic was temperamental (to say the least) and required frequent adjusting with temp and humidity changes (two things that happen a lot in Southern Indiana). One of the reasons I traded it off for a different guitar. 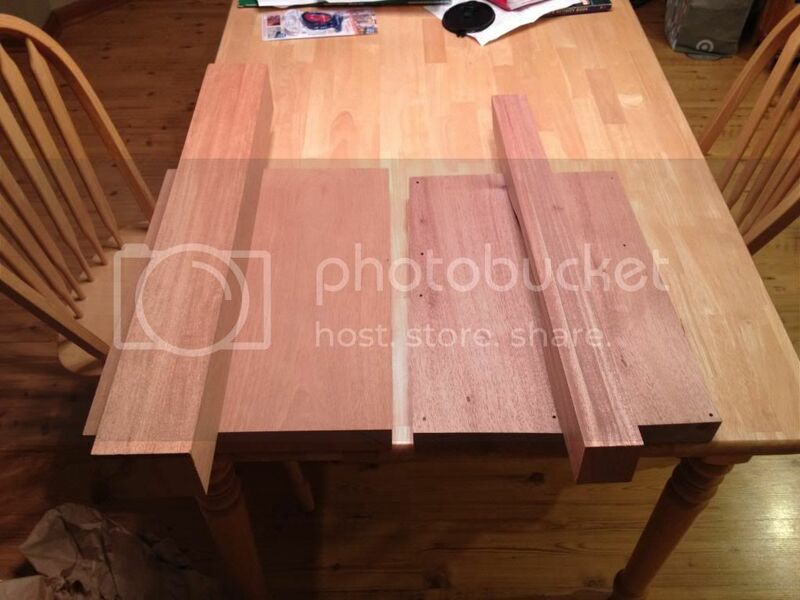 I have ripped the fairly warped, flat-sawn, neck board into 3 pieces. I struggled with grain orientation, but read some fairly good descriptions of the process on this forum. I labeled each piece according to how they came out of the original board - Left, Middle, Right. Then flipped L & R in a way to keep the most straight grain, while the curvy parts at the bottom corners will be carved off of the heel. The middle section was fairly straight throughout, and I just flipped it end over end. 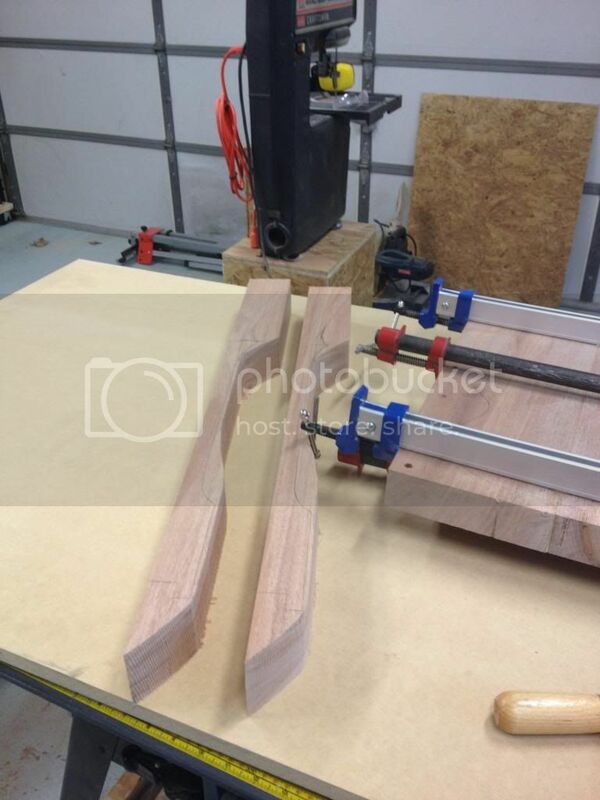 After jointing and planing these boards square and to the correct thickness, I glued up into a blank. It's a little gappy at the ends (planer snipe and such) but that area is all waste anyway. The seams are fairly invisible throughout the section that I'll be using. For the 12/4 board, I needed to get it down to 1.75" for a body blank. Lacking major resaw capacity, and wanting to not waste the extra inch of wood, I planed and joined the board reasonably square. Then taking a series of progressively deeper cuts on the table saw, I was left with a little strip in the middle to cut by hand. Or so I thought. Sorry, Barnaby, I'm not man enough for this. After about two inches of cutting by hand with my "Japanese" style (piece of Harbor Freight junk) saw, I broke out the big guns and made short work of this cut. A couple passes through the planer and it was ready to go (almost). I let it sit for a few days to do any moving it felt like, and it developed just a little twist over the length of the whole board. 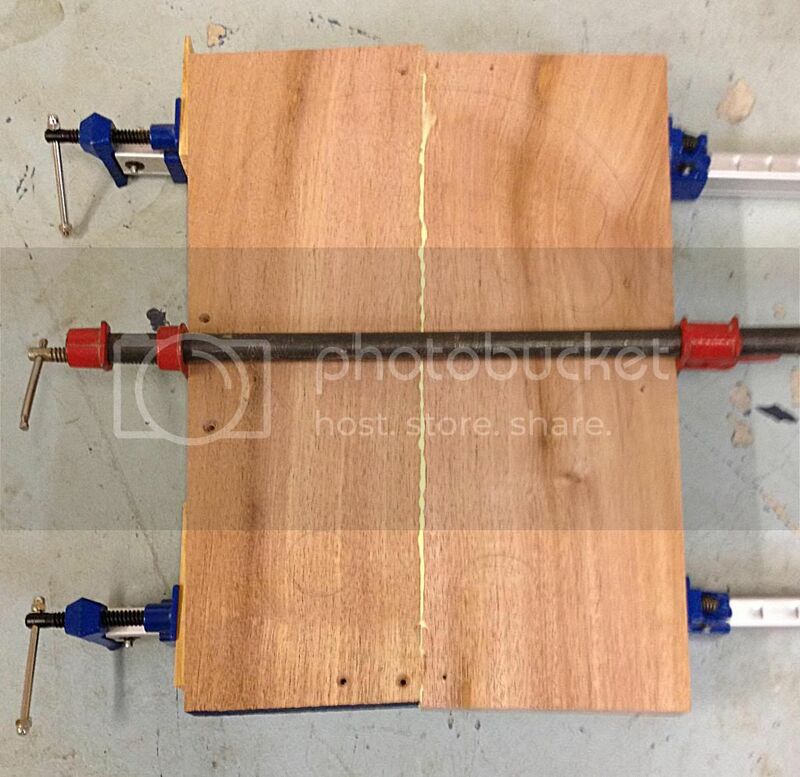 Since my jointer is only 6" and my planer isn't going to take a twist out, I set up a temporary router planing sled (which has since turned into a permanent structure with hinges for routing neck and pickup angles). This gave me a good flat side. Run back through my thickness planer to clean up both sides and my board was flat, square, and exactly the thickness I wanted. 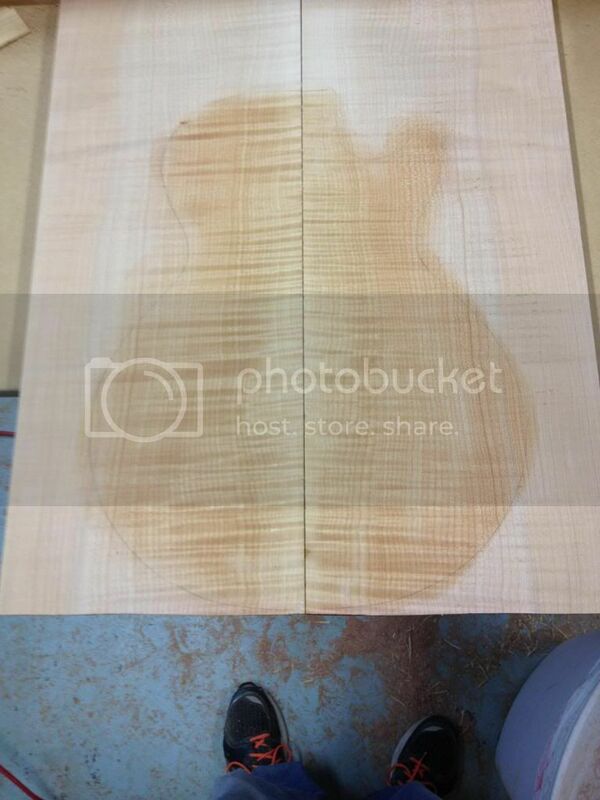 Performed the same resaw procedure with my maple top. But either the sawzall blade was significantly dulled by that point, or the maple was just a little bit extra hard, but the blade wandered quite a bit this time. Turned out okay after planing, since I started with over 2" thickness, but if I had tried to resaw a thinner board this way, I would have wound up with pieces too thin to make a proper LP top. One thing that only became apparent after milling the body wood, were these little spots, and there are more than just these two in the photo. Not sure if they are worm holes that have been filled? Sure didn't look filled when viewing the rough lumber. 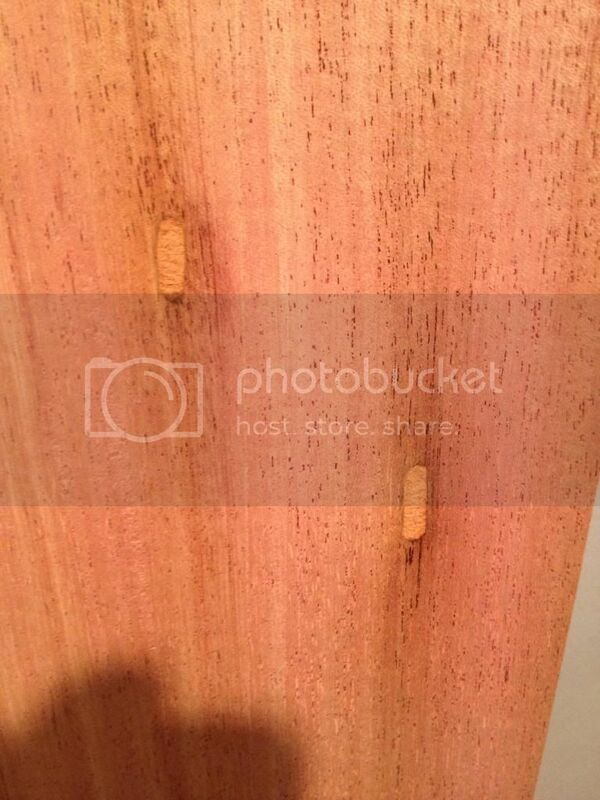 I've never seen anything like it before, but I've never use African Mahogany for anything before either. They don't look like knots (and the same board has some small knots of the normal variety) so I don't know what this is. I thought I could cut around them....(more on this later). Thankfully the neck board has none of these. 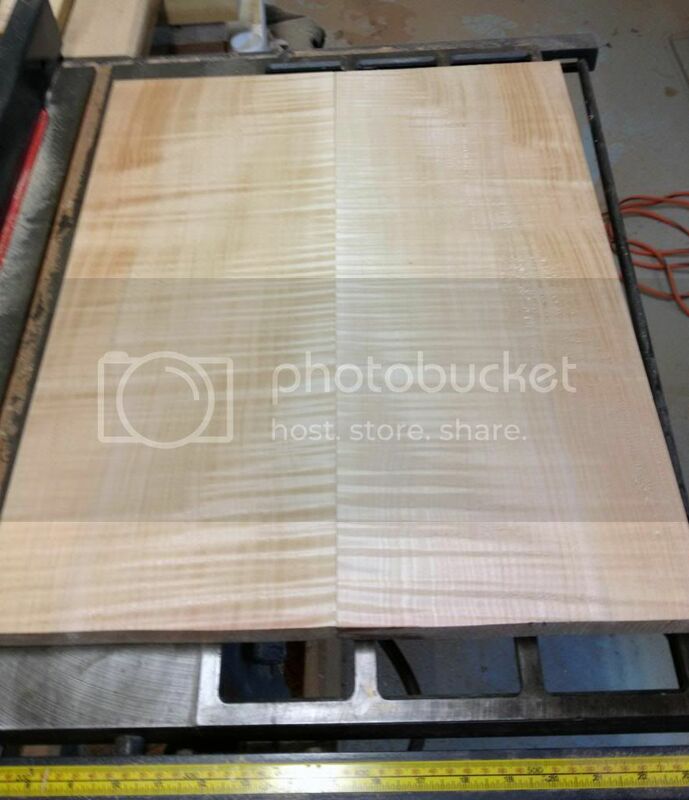 Letting my blanks sit for a while, I turned my attention to making templates. Printed out my customized plans, cut out with scissors, and glued down to some 3/4" MDF with good old 3M 77 and a bondo spreader. Then, cut out rough shapes with a jig saw, cut close to the lines with my bandsaw, and spent a lot of time with the Ridgid Oscillating spindle sander making them nice and smoth. This is the only NEW power tool I've purchase for this project and so far it has been a real treat to use. I'm glad I saw so many glowing recommendations for it here on the forum. And I scored two more sets of sanding sleeves at Menards (don't know why they had Ridgid products). They were a discontinued item and I got two packs of 10 sleeves for less than 4$. Time to show my first struggle and series of discouraging mistakes. I had a VERY, VERY hard time getting a perfect seam between the two halves of my body. Same thing with my maple top. It would be tight at the edges but wind up with a slight gap in the middle. I think this is because my jointer is not set up correctly, but I'm not exactly sure how to correct that. I think the outfeed table needs to be raise just slightly. If I'm not mistaken the board is rocking over the cutter head ever so slightly, taking off just a bit more in the middle than the ends. But I'm not sure (because I don't know what I'm doing). While trying to joint the two halves, I screwed them together to run them across the jointer as one piece. 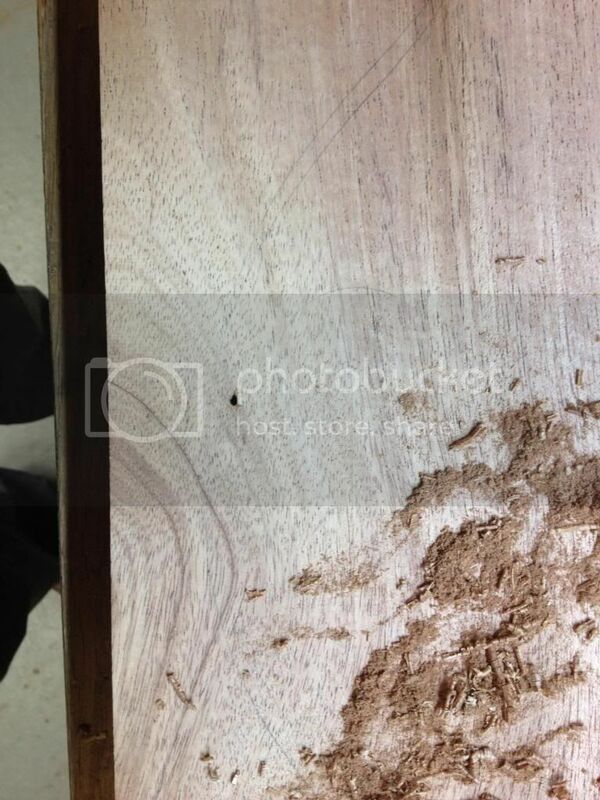 Didn't predrill large enough into the mahogany and it split with the grain, extending about 3/4" into the finished area. Oops. It was a small crack, and I couldn't really get titebond in there without making a huge mess, so I wicked in some water thin CA and clamped it shut. Seems to be okay. During the struggle to get a good flat edge on these two halves, I tried flipping them around so they were spooning together instead of face to face (thinking this might solve the issues my jointer was creating). Except I didn't drill new screw holes and sunk a screw right into the good area along the back side of the body. Oops #2. Filled with shavings, sawdust and CA glue. Now I know that the CA glue might cause me some finishing problems later. Too late now. And things went downhill from here. 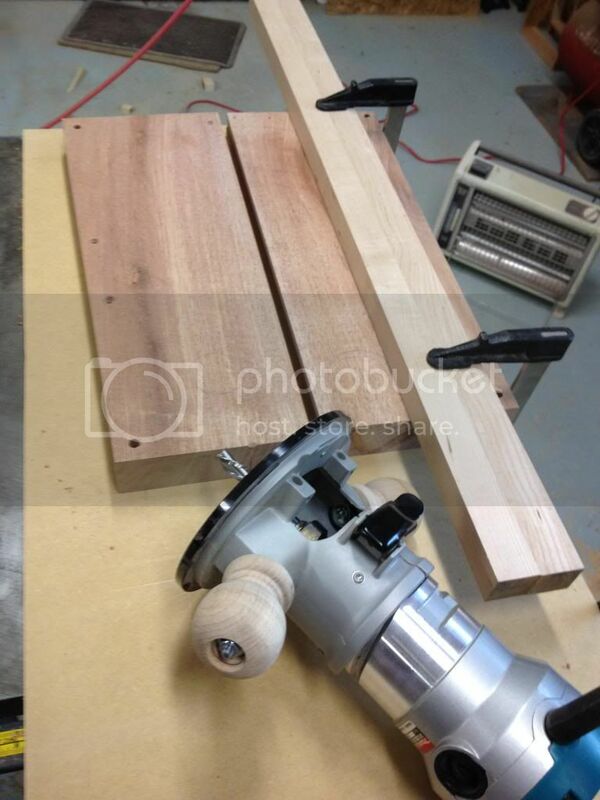 The FIRST time I glued the halves together, I saw a slight gap and was able to pull it out with clamps on my dry run. So I said "to hell with it" and glued it up. And then the next day I find that the gap had opened up (or perhaps not pulled shut when full of glue) even while under clamps over night. 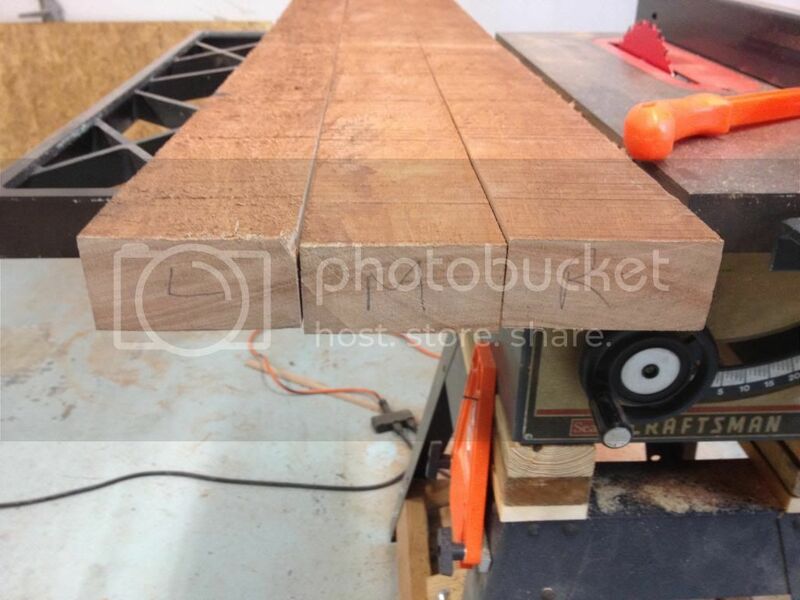 what grit do you use on the ridgid sander for the templates? 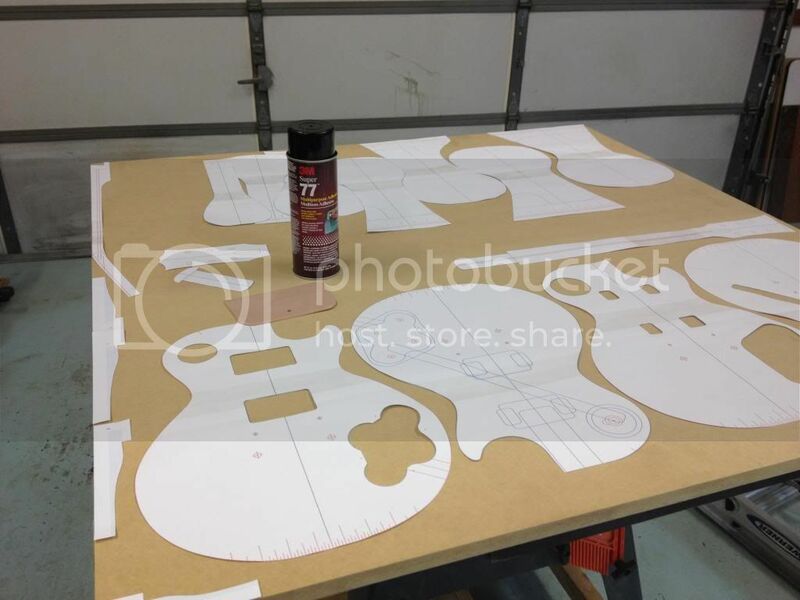 At this point, I was nearly ready to throw in the towel, thinking "If I can't even glue to pieces of wood together properly, how in the hell am I going to make a playable guitar?" A few days away from the project, and a cooler head combined with perseverance payed off. I ran the ragged edges back through the jointer, which left them reasonably smooth (albeit with the same problem I had originally.) I screwed the halves together (face to face or back to back, don't remember) and ran a pencil along the edge to be joined. 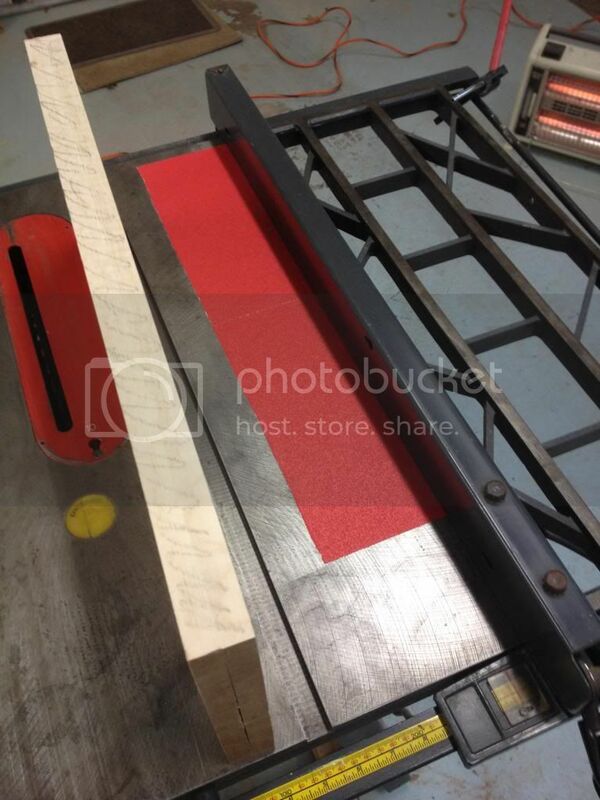 I spray glued some 80 grit sandpaper right to the cast iron top of my table saw (flattest surface that I own) and set the rip fence next to it. I ran the screwed together body halves on edge until the pencil marks were gone, checking frequently for high and low areas. Once I could gently apply pencil to the whole thing and remove it all with a few even strokes, I put the pieces together on edge and tried to shine a bright light between them. A little bit of fine tuning and I knew I finally had two good, straight edges, ready for gluing. 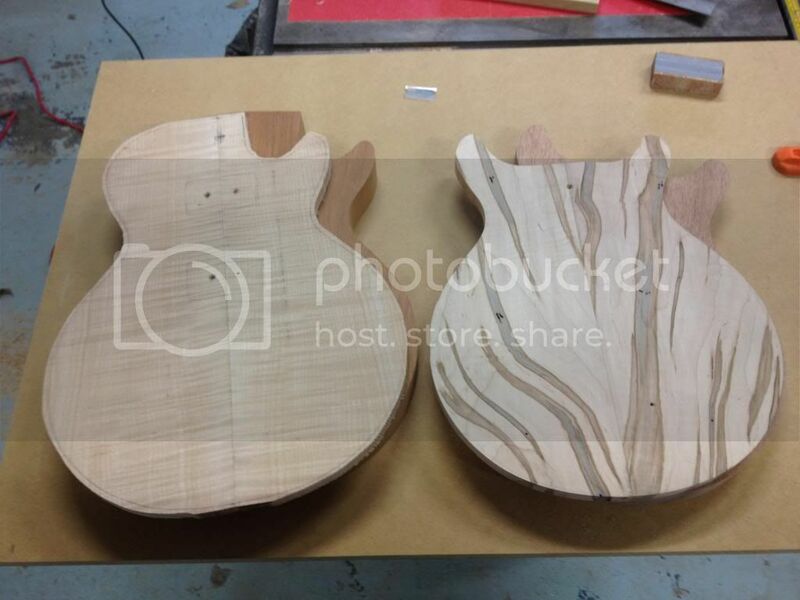 I didn't take pics of this, but here are a couple shots of my maple top, which I prepared in the same fashion. And I finally had a 2 piece body blank glued together. While that was drying I went ahead and cut my neck blank into two necks on the bandsaw. I just used the grit that came with the spindle sander, which I think is 80. 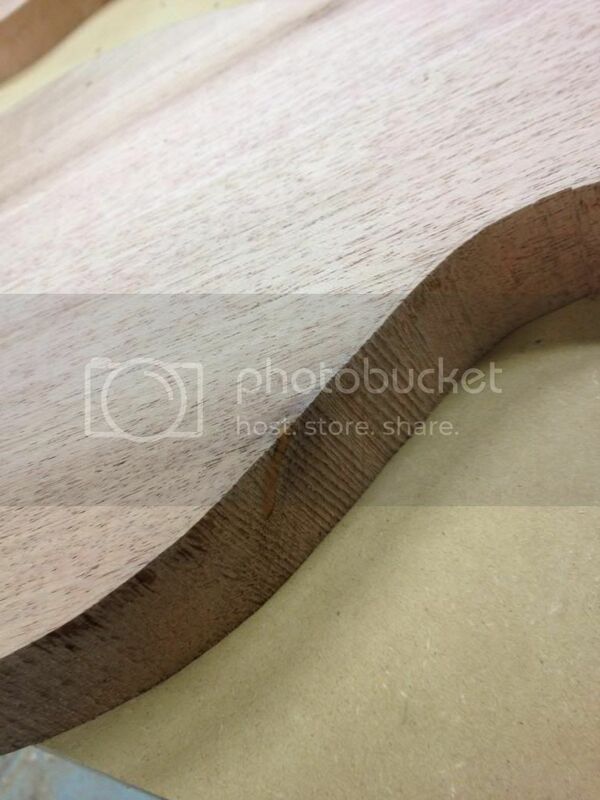 Left a smooth enough edge on MDF for me. I also have 120 or 150 spindles, but haven't used them yet. Might never need to. I plan to do all my finish sanding by hand most likely. And during glue up. This board started to cup a little bit (remember when I said it wasn't dry enough?) Pretty sure this was because of moisture content and the fact that I removed too much material from one side when thicknessing, because of my ragged sawzall resaw operation (as opposed to removing thickness evenly from both sides). So, when I glued it up, I screwed one half down to a piece of MDF (with box tape under the glue joint) clamped the second half to the first, then screwed it down too and clamped everything like crazy. Hand routing with a Spiral bit of that size. Id rather you than me. Yeah, I had an "incident" with that bit later on. Will discuss in detail when I get to it chronologically. Starting to learn when and where it's appropriate to use that bit. This wasn't one of those cases, I guess. 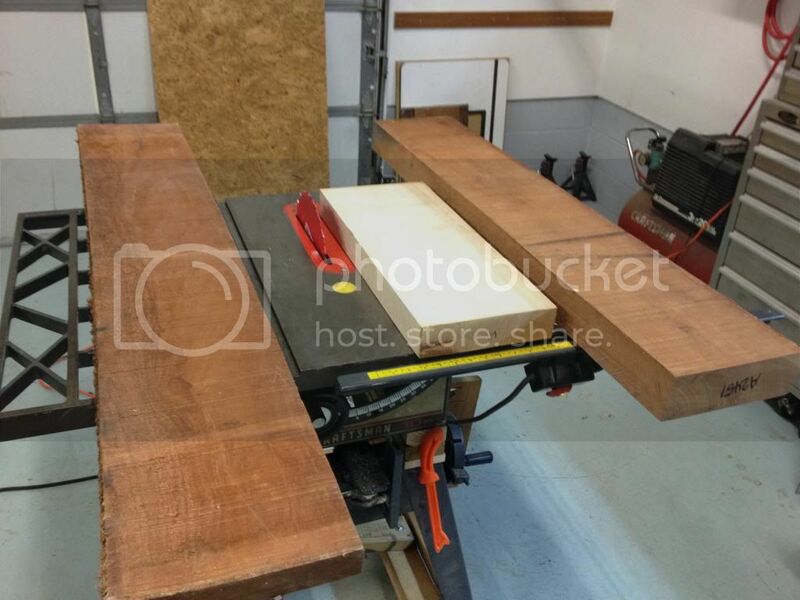 At this point, I bought some really nice South American Mahogany from forum member JMorris. At the time he had some extra blanks for sale and advertised them here. I can't say enough about how nice this stuff is compared to the much denser African Mahogany I had been working with up to this point. Also, what he sold me was already milled to the correct dimensions. The body blank was a gorgeous one piece slab, and the neck blank is 3 piece, just like I wanted, and wide enough that I don't have to add ears! Thanks again for the awesome lumber! Unfortunately the wood rode around in the back of a UPS truck for days in extreme low temperatures, because we were gripped by a winter storm and they refused to deliver to my street (I live on a hill). Once it arrive, I kept the wood in the house for weeks before doing any work on it to try to let it acclimate. I gave the neck a pass over the jointer and it was good. The body cupped just a tiny bit right along one edge, but I just cut my body shape out as far away from that edge as possible and the body turned out perfectly flat. 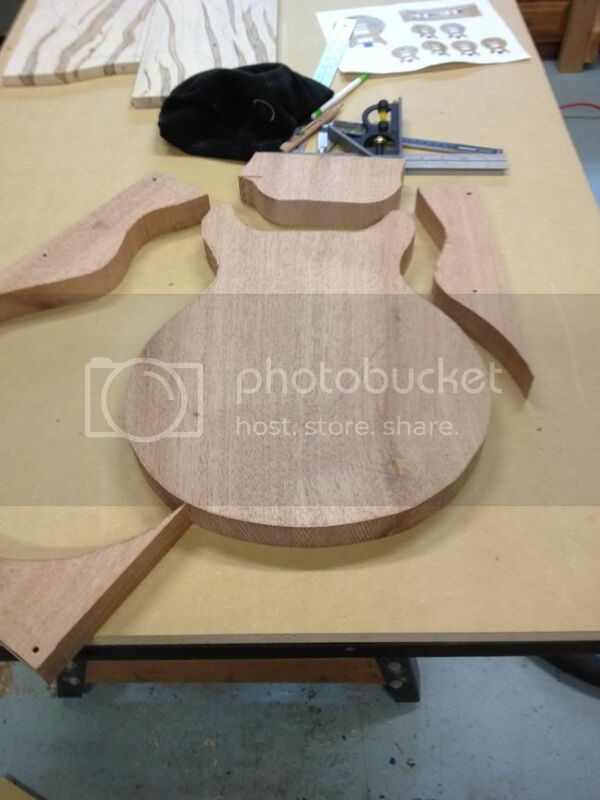 Now, my already ambitious project split off into TWO guitar builds. Since the SA Mahogany was much, much prettier and lighter weight, I decided to pair it up with the flame maple top I had been working on and use that for my LP build. For the other wood that I had already spent weeks on, I decided to make a double cut guitar loosely based on one of the Hamers that I already own. This one has become a kind of test bed, and I do most operations on it FIRST in case I make a big mistake. Since the African body was heavy, doing a double cut (and quite a bit thinner body too) will make it more back friendly on the finished piece. So, I went back to the planning stage and took tons of measurements and drawings, and made my second set of digital plans and templates. This was a good time to do it, because the extreme cold kept me out of the shop for a few weeks. The garage is attached to the house, and my HVAC is out there, so it never gets lower than 36 F or so, but the concrete floor is pretty brutal on the feet when it's that cold and a space heater will only get me so far. I'm sure all the Canadian builders are laughing at me, but we had a pretty brutal winter for this part of the country. Two weeks in a row of the daily high being zero degrees is too cold for my taste. My daughter stole my pencil when I wasn't looking and "helped" with my plans a little bit. 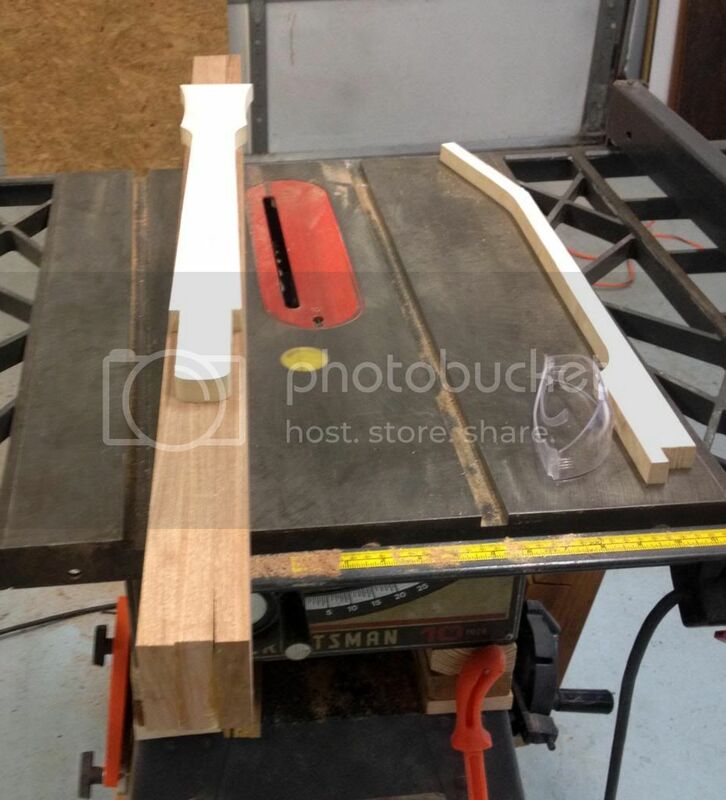 Fast forward a bit, and I've bandsawed my double cut body out of the 2 piece blank. Remember those weird worm hole things? My blank got a lot narrower than originally intended from cutting it back apart and jointing the inside edge repeatedly. I could no longer cut around all the worm holes as I had hoped. Unless I wanted a really skinny guitar. 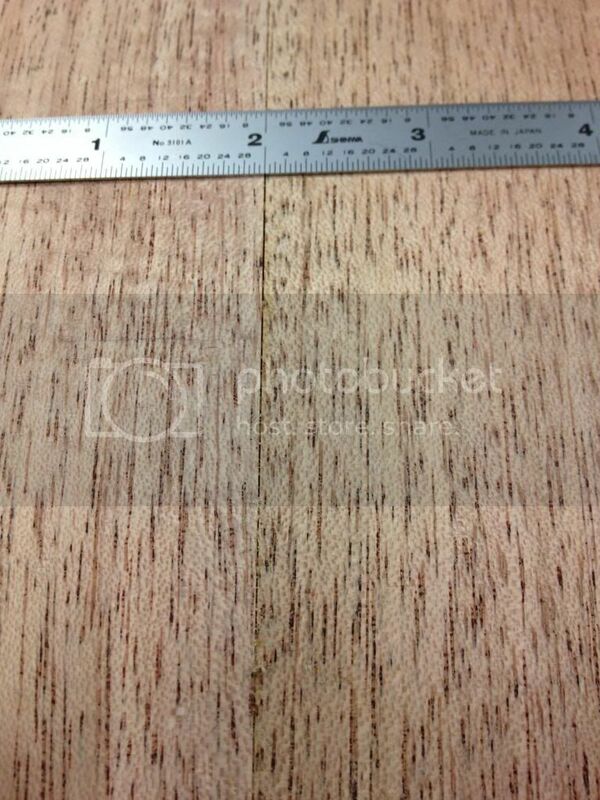 Here is the one piece body cut out and sanded close to the lines. I took multiple passes, but was still NOT very pleased with the quality of the edge and wound up spindle sanding everything more anyway. In the future I will probably spindle sand anything and everything that can be done without a router. I don't know why I got it stuck in my head that this was a bad thing. It may be slower, but is fun, rather than scary, and I'm not mass producing anything. Who cares if it takes a few more minutes? 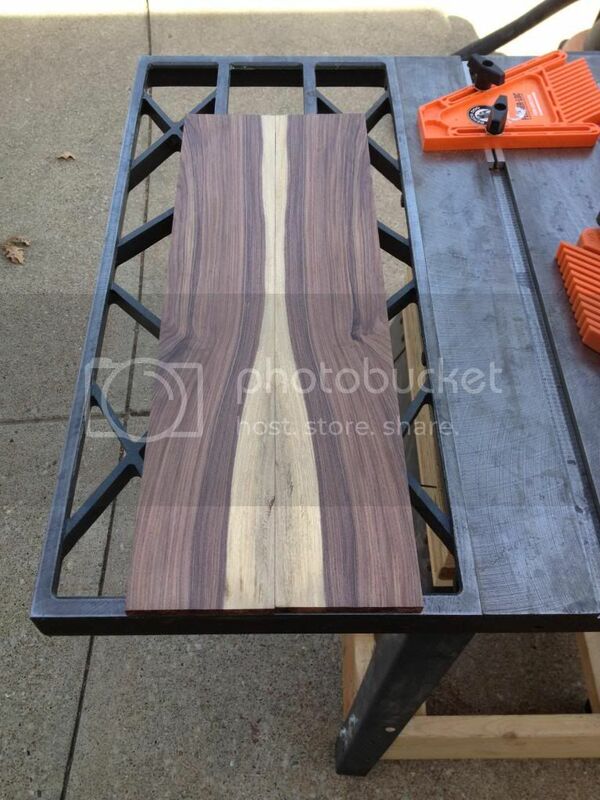 We had a really nice Saturday (first sunny day in months) and I wheeled the table saw out in the driveway and resawed a piece of Bolivian Rosewood that I bought to use as fretboards. I've read horror stories about strong allergic reactions to Morado, Cocobolo and other Rosewoods, and while I haven't shown any sensitivity to this yet, I have been bothered by other woods in the past and have been taking extreme precautions when sawing or sanding this stuff. 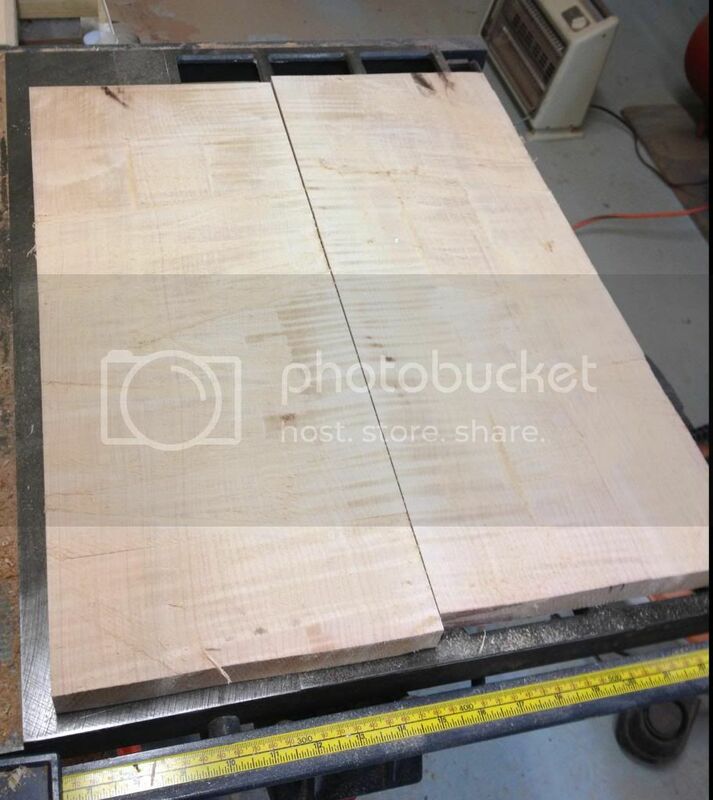 Needing another maple top, I dug out an Ambrosia Maple board that I had been sitting on for a while. Bought it on ebay almost a year ago, because it was pretty. Had no idea what I was going to do with it. The top wasn't thick enough to bookmatch and still do a carve top (only about 7/8" to start) so I took photos of it and played around with it endlessly on the computer until I found a good combination of pieces that I could cut out that would yield a pretty top. I nearly had a disaster here. I traced my outline of each half to get a visual before I cut the two halves out of the same board. Then I spent forever jointing the edges before gluing the two halves together. Without re-tracing my body outline, I cut it out on the bandsaw, using the original lines which were now maybe 1/4" too narrow. Oops. Looks okay in the photo, but when I layed my body template over it, the template was actually bigger than the top in a few places. It was just slightly too small, and I knew most of that difference would be taken away by the binding channel, so I went ahead and glued the top on the body and then spindle sanded everything very very close to where it should be. It wound up sanding it skinny in a couple of spots, but it turned out fine. Crisis averted. 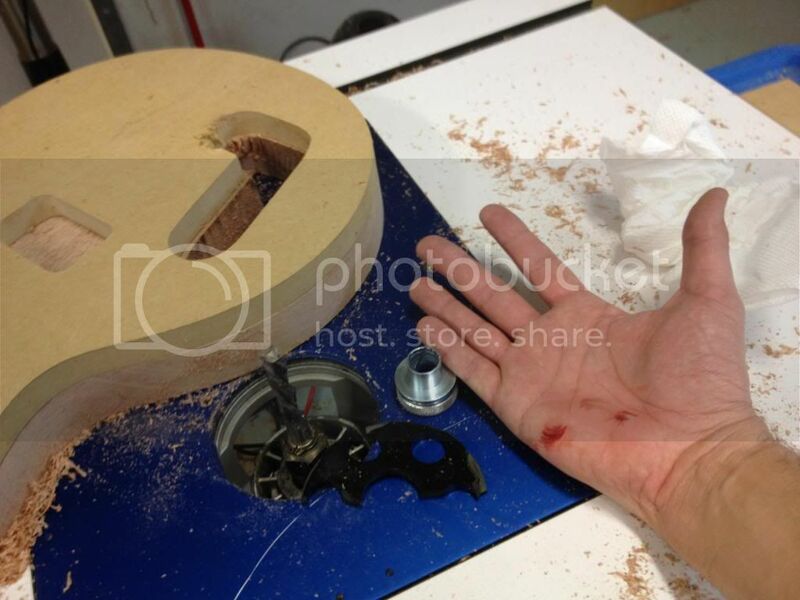 I also learned a valuable lesson about router tables and big spiral bits that day. If you've set your bit where you want it and it's sticking out of the table, and you're using said table as a work surface even when not routing, put a damned cover over the bit. I just barely grazed one of my dry, cold knuckles against the razor sharp tip of the that 3 flute blade and proceeded to bleed for a half hour. Routed the wiring channel in the LP body. Looking back on the process, it could have been better and safer. 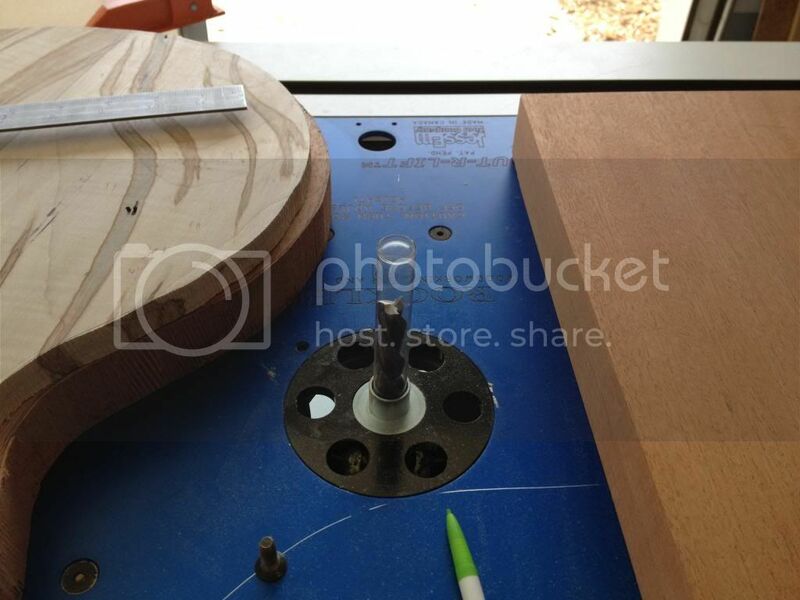 I attached my template and then drilled a hole with a forstner bit to give that big spiral bit somewhere to sit. Put the body upside down over the router table and made a blind cut, relying on the template and bushing to stop me at the correct spot. I took it in 3 or 4 progressively deeper passes, and it worked out okay, but I don't like the idea of starting that big bit up inside a hole, just in case it were to make contact with something before coming up to speed. And blind cutting always makes me nervous anyway. 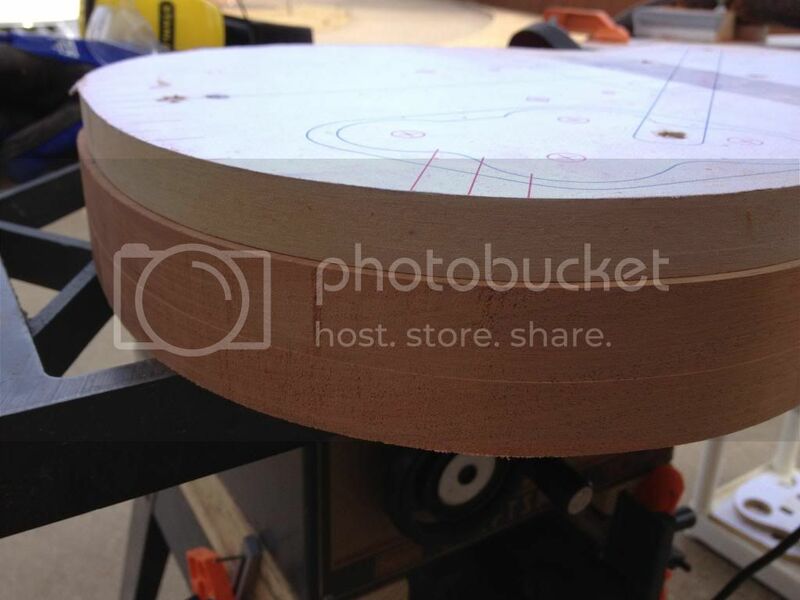 In the future I'll probably use a smaller, straight cutting template bit in a plunge router. 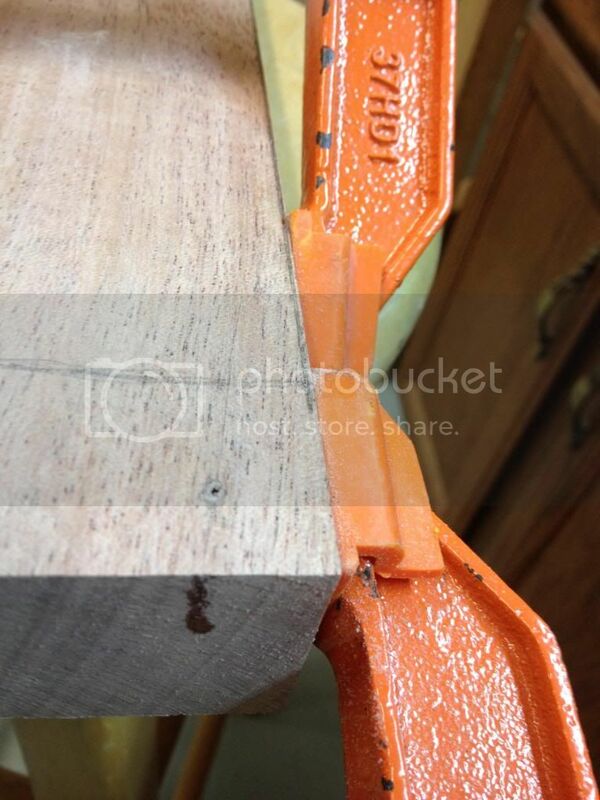 I have a plunge router but didn't own any top bearing bits at the time. Template city. And I have another 12 or so for the top carves, plus a few more. 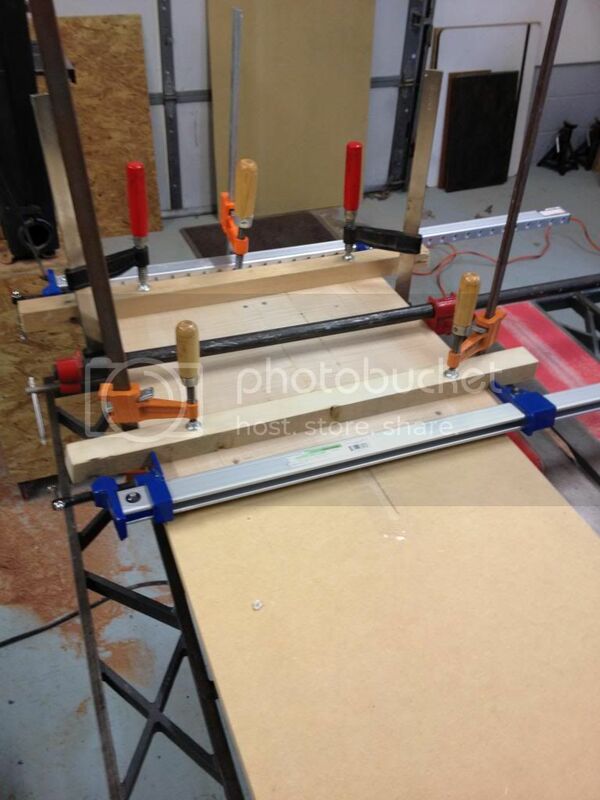 I've used two 4x8 sheets of 3/4" MDF on these build so far with all the templates and jigs. It's good stuff. And one of the leftover pieces became a dedicated work top to lay over my table saw. I scribbled "TABLE" on it in pencil so I don't accidentally grab it to throw together a jig someday. Two tops and two bodies, ready to be glued together. For the record, I used Titebond II for all joints so far, and for gluing the tops to the bodies. I plan to use Titebond I for the neck to body joint, and the FB to neck joint, in case I wind up needing to take them back apart. Let's hope I don't have to. All respect to those that go for vintage correct hot hide glue but I could care less about cork sniffing at this point in my shoddy building and I move waaaaay too slowly to use it. Maybe some day. 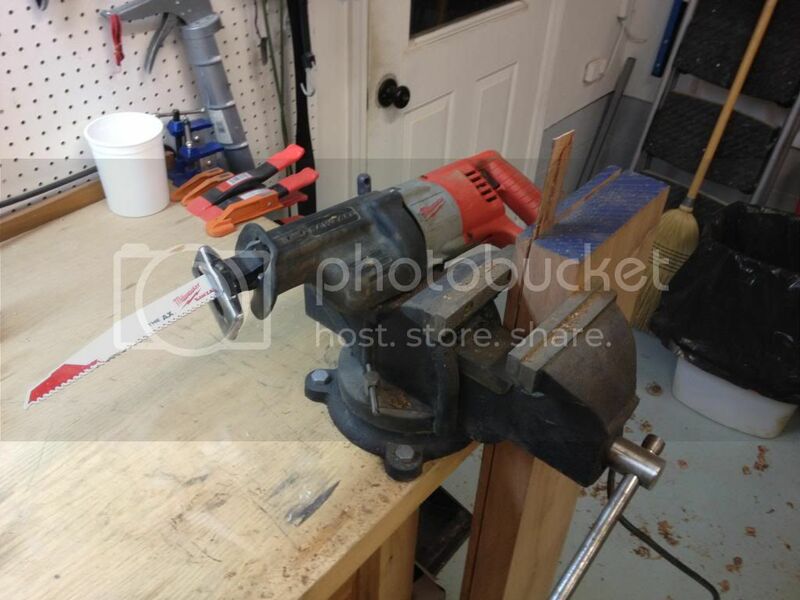 I was using my router table with a 1/2" solid carbide spiral bit and a template bushing. I tried to use it on an inside hole (control cavity route) that I had hogged out with a forstner bit, but had not spindle sanded as close as I should have. This photo makes me sweaty. Because I know what came right after it. Mistakes were made. I took a full depth cut (4" bit with 2" cutting length) and at some point while wrestling the body around the bit, I got mixed up about feed direction. BANG! 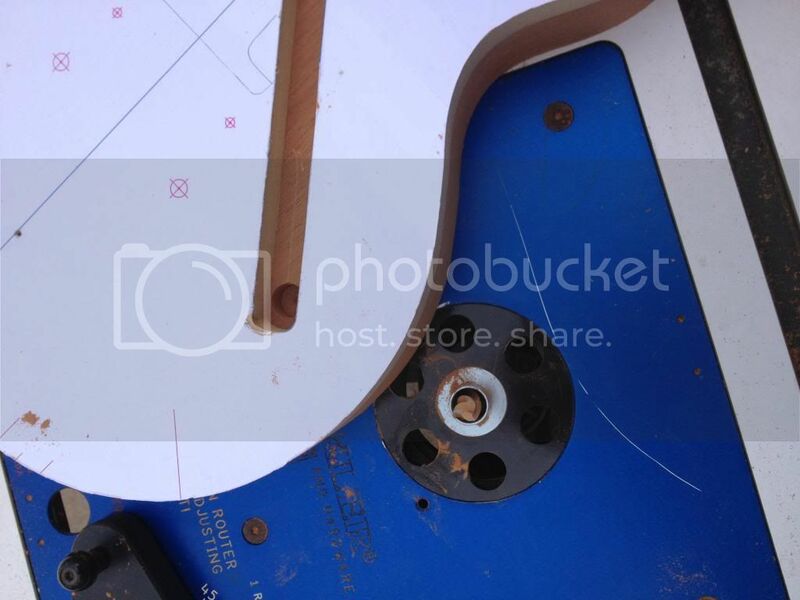 The bit got a good bite and jerked the guitar body, slamming the template into the guide bushing, which caused the plastic insert in my table to explode. The bushing flew off towards the ceiling and the body flew across the shop. Thankfully my stomach got in the way. A full two minutes passed with the router happily spinning away and a guitar body at my feet, while I checked myself over, looking for the things that DIDN'T hurt yet. The palm of my right hand received a series of 8 or 9 parallel incisions from the sharp edge of the guitar body, that were a perfect mirror to the massive gouges that the spiral bit left in the side of the control cavity. 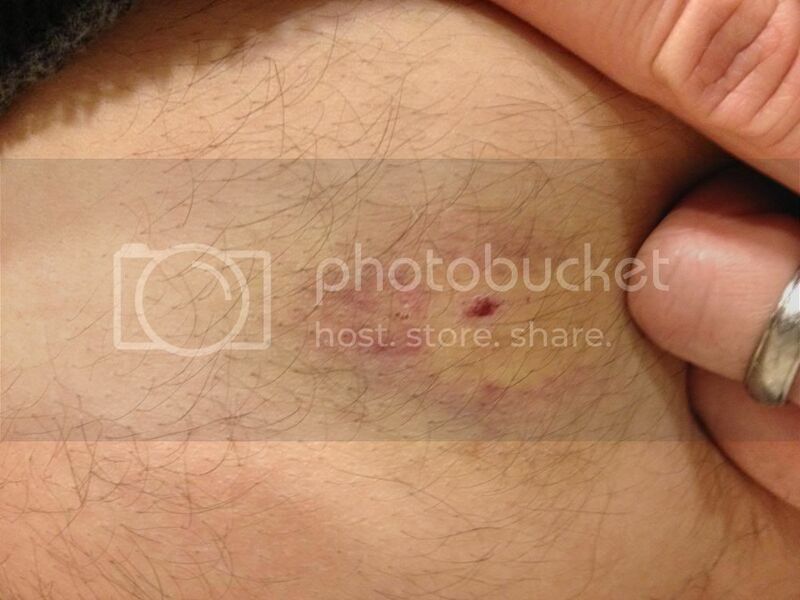 And I had a large bloody black bruise on my stomach for a long time. The hand healed up nicely (I played a gig less than a week later) but my belly is still a little tender and this happened back in February. Gratuitous belly shot from around 10 days after the incident. I didn't take any pics of when it looked really gross. Had to buy a new plastic insert for my table and spent some money to have my spiral bit sharpened, but everything on the guitar was easily fixable since that one is sort of my own design. I just made the control cavity a slightly different shape. 1. NEVER take a full depth cut. Just because the bit is long enough doesn't mean that's a good idea. 2. Spindle sand everything. For the hobbyist this leaves a perfectly decent edge and who cares if it takes a little longer. I'm not mass producing these things. 3. 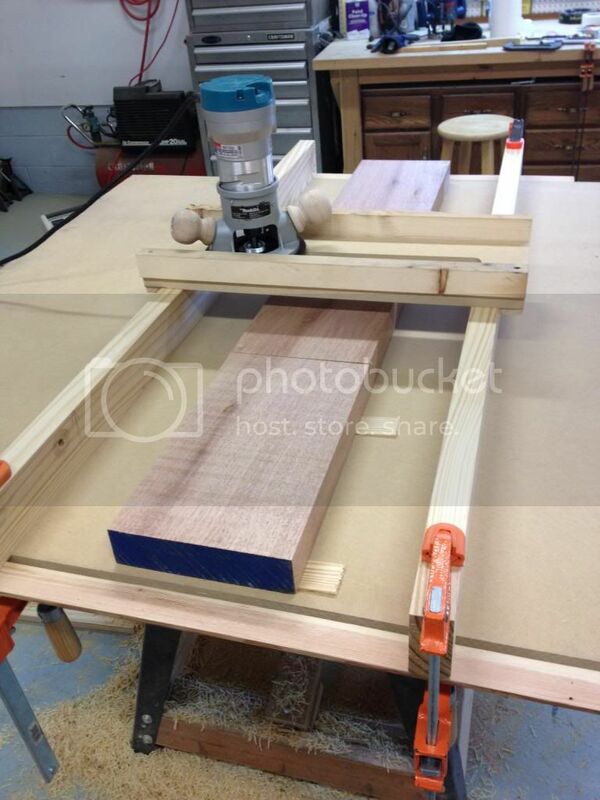 Be EXTREMELY aware of feed direction on a router table or with any router for that matter. I now always do a dry run and practice my movements before I ever turn the power on. 4. 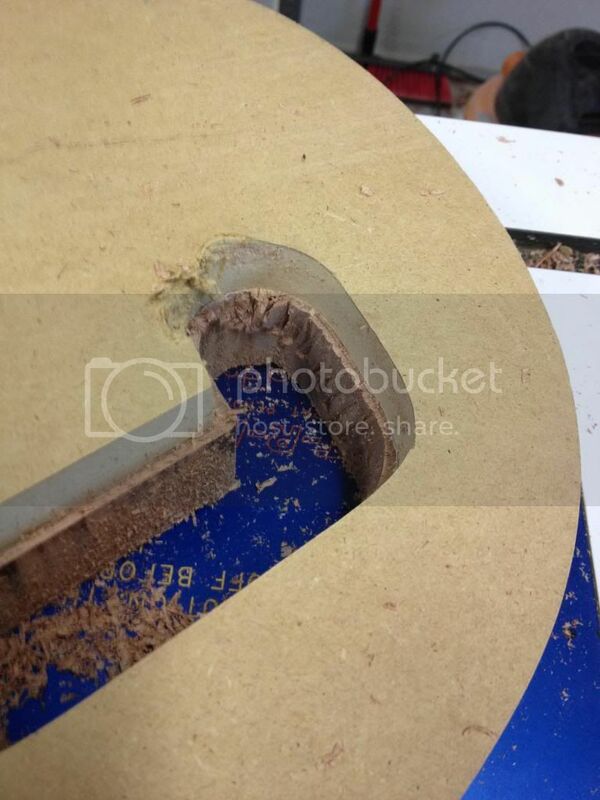 The bit was a spiral DOWNCUT bit, which isn't really appropriate for a table since it pushes AWAY from the table. I still have used it in the table, but I now nibble at the workpiece instead of taking deep cuts. 5. I usually don't wear gloves around power tools because of the risk of snagging fabric and getting pulled into the equipment, but I've started wearing some clean, padded mechanic's gloves when I use the router table. If I had worn them the first time, my hand wouldn't have been hurt at all. I don't use gloves if I'm getting anywhere near a blade with my hands, though. The only near misses I've ever had with tools have been because I was trying to do something other than it was intended to do. Usually out of haste or more often to make up for a special tool that I don't have. As I get older, I try to be a little wiser about those things and take my time. 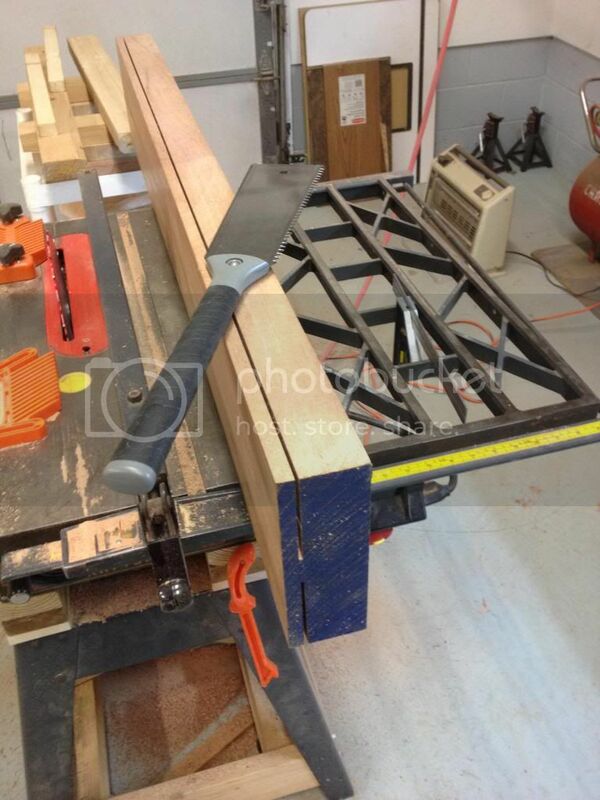 If I feel like something could be dangerous, I come up with a jig or clamps or a different method to make the cut. Hopefully this helps somebody. I'm actually glad it happened because I learned a lot from the mistake and didn't hurt anything important.